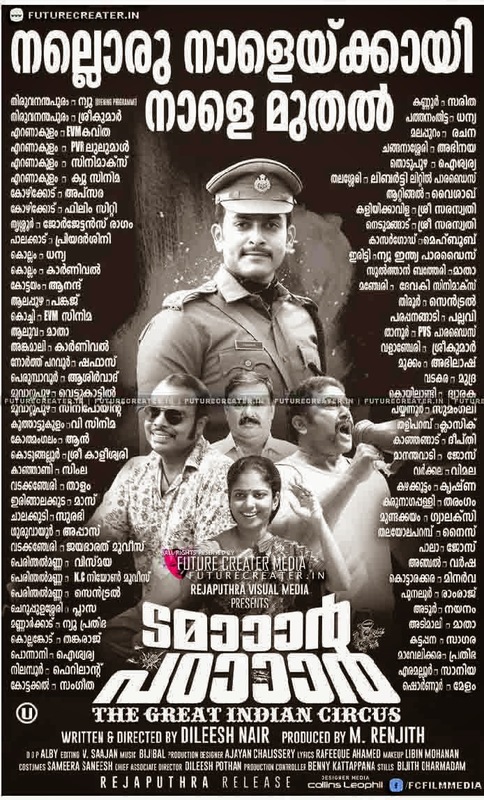 Prithviraj’s new Malayalam movie “Tamaar Padaar” got released on today. Its a satirical comedy film scripted and directed by debut Dileesh Nair. The title of the movie is too catchy to grab audience attention at the very first moment. Now the question is whether this movie is worth to watch or not. For the last few movies Prithviraj’s selective approach to done movies is much appreciated by the audiences and critics, but this time it got downwards by ‘Tamaar Padaar’. A weak storyline along with listless scripting makes this film break the success series of Prithviraj. After watching this, everyone will think about how ‘choosy Prithvi’ select this script that doesn't give him anything to perform nor does it have anything exciting to offer in terms of overall plot. Jumper Thambi, Tube light Mani and Pauran IPS are the three characters around which the movie is narrated through the voice of Adv Jayashankar. Each character is introduced one at a time and their story is told one after the other. By the first half gets over we get a picture of Thambi and Mani while Pauran makes a brief appearance at the stroke of intermission. The three characters does not have any connection but at some point the story interlink these three to take the movie forward. For making viewers laugh and entertain, actors like Baburaj and Chemban Vinod do their best making appearances in films in between moments and situations. But to watch them continuously for an hour was too tiring though the two actors did their part well. By the time Prithviraj appeared, it was too late and it was all for a loosing cause. The narrative style of the movie with the voice of Jayashankar was plain irritating. It the whole picture , Baburaj and Chemban Vinod score well. Baburaj and Chemban Vinod gave their best to entertain but with limited success. For Pritviraj, it was totally a wrong choice of selection and all this movie would do is to break his continous success and good selection of scripts he makes these days. Srindha Ashab as Valsala was nice in her brief role that does not have any major presence in the overall story. Debut Director Dileesh Nair’s direction was good, but in according to the narration style and Script, that done by himself is makes the movie below average. Bijipal has done a neat job with the two songs while BGM was also nice. Cinematography by Alby was good while the editing wise it go down. Tamaar Padaar somehow it fails to entertain and satisfy the audience, but have some non-repeated comedy scenes in it. But it make out a disappointment after watching.